In our industry we see it every day, the misperception of what a bioethanol fireplace truly is and what it is not. In this post we take a look at the benefits of these fireplaces and also the preconceived perceptions that consumers generally have. A starting point would be to summarize what bioethanol is. Ethanol is derived from non-organic material such as oil and natural gas and bioethanol from organic materials such as grapes, sugar beet and sugar cane. The plant based material is put through the fermentation process to produce bioethanol. Bioethanol is generally around 96.5% pure alcohol. It is used in many industries such as food production, mining, product manufacturing and using it as an alternative to Diesel and Petrol. Uses for Bio Ethanol. Due to the nature and composition of bioethanol it is considered to be a clean fuel, meaning that the emissions are so low that you do not require a chimney to extract the exhaust fumes. The fuel when burnt, burns 100% clean leaving no residue behind. In Johannesburg where bioethanol is used for public transport the exhaust fumes created by the buses are cleaner than the ambient air outside. This function allows companies like Beauty Fires to design and develop amazing products that make use of bioethanol. The fact that traditional constraints such as a chimney or gas pipe is not present allows creatives like interior designers, architects and manufacturers to produce unique products and designs to be installed in locations previously not possible. Bioethanol fireplaces can be as simple as a burner that you incorporate into your own unique design to more elaborate designs that suspend from a ceiling or mounted onto a wall. The possibilities are truly endless. The underlying benefit of these fires is the positive impact on the environment. Unlike gas and wood burning fireplaces, bioethanol is carbon neutral. The most common miss perception of bioethanol as a source fuel for fireplaces is that it doesn’t provide heat. This is certainly not the truth. 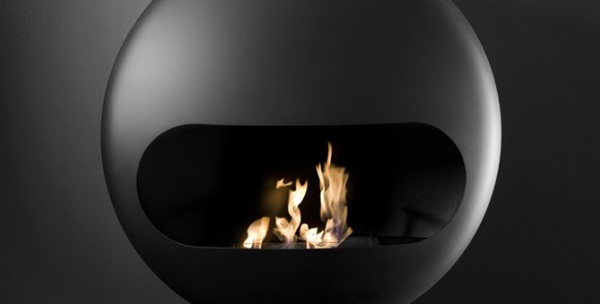 There are many bioethanol fireplaces that produce more heat than wood or gas fireplaces. To simply compare wood vs. gas vs. bioethanol with regards to heat output is like comparing a small family car to a sports car for top speed. Both are cars but they serve a different need and purpose. You have to compare ‘apples’ with ‘apples’. Your lifestyle and needs assessment should be the first step when selecting a fuel source for a fireplace. If your need is to have a fireplace that burns throughout the day on most days then you should seriously consider a closed combustion wood burning fireplace and not bioethanol. Closed combustion wood burning fireplaces are more economical to burn over extended periods of time but the trade-off is a permanent fixture, the maintenance and the time it takes for the fireplace to produce heat. For people with space limitations, professionals and city dwellers who require an instant heat or for whom it is impractical to install a wood burning fireplace the bio ethanol option should be the obvious choice. Biofuel fireplaces are also a very viable solution for consumers that rent property as in most cases the fireplace is either freestanding and mobile or easily removed without compromising the property. They can therefor invest in a quality fireplace without needing to part with their investment when they move. Once your needs are matched with the appropriate fuel type you look at the volume of the space you wish to heat. There are options in across the fuel options to suit most spaces. This is the second step and equally as important. Heat output is measured in KW/h. You take the volume of the area you wish to heat and divide by 30. The answer will give you a good indication of the KW size fireplace you need. For example if your space is 270 cubic meters you will require a 9KW fireplace. This is a general way of calculating but be aware that factors such as the amount of glazing, high ceilings and other factors that impact on the insulation of your room and home will impact on this calculation. The myth that bio ethanol does not produce heat is simply that, a myth. The myth is fueled by people who did not complete step one and two appropriately. To put a small bioethanol fireplace in a room larger than its intended capacity will not produce the results you require, it will not meet your expectation and therefore not meet your needs. The result, a perception that bioethanol is not a true heating source. With our instant gratification desire and the global trend of urbanization, bioethanol certainly has a place in the market. Next time you consider purchasing a fireplace, complete step one and two and consider bioethanol if it matches your lifestyle and needs. It will keep you warm in winter and Mother Nature smiling. I rate the bioethanol fireplace as a friend indeed.